cheeseburger, fries, nuggets, and a drink for $5. 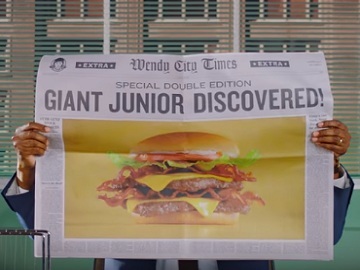 The 30-second spot features a man reading in a newspaper the news about the Giant Jr. Bacon Cheeseburger, who’s informed by the voiceover that this cheeseburger is made with “Giant-izer”, with double the fresh never frozen beef, double the oven-baked bacon, and double the cheese. “It’s a Junior that made a big name for itself.” – the voiceover adds at the end of the spot, mentioning that, now, for a limited time, the Giant Jr. Bacon Cheeseburger with fries, nuggets, and a drink is just $5.